People across France are protesting the rise in taxes on fuel prices wearing the yellow vests which are mandatory for French drivers, giving the movement the name Gilets Jaunes. On November 24, thousands of protesters hit the streets of Paris to protest the rising fuel prices in the country. The demonstrations were independently organised in different locations, and have been identified as the ‘Yellow Vests’ (Gilets Jaunes), because of the yellow high-visibility vests worn by the protestors. 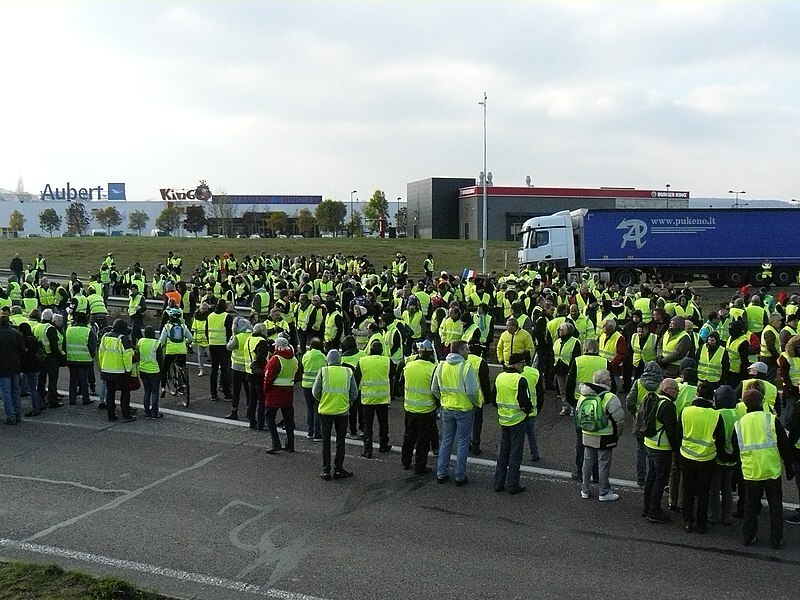 The demonstrations involved blocking of important intersections, roundabouts, gas stations, and roads by protesters wearing the high-visibility vests which are mandatory for all drivers in France. This is the second round of protests on the same issue. Earlier, on November 17, more than 280,000 people participated in over 2,000 different demonstrations across France to protest against the government’s plan to increase taxes on fuel. In certain areas, confrontation by angry car drivers and police personnel led to more than 500 injured, including over 90 police personnel, and two deaths. The Yellow Vests protest was largely triggered by the government’s decision to further hike taxes on diesel and petrol on an already high rate of taxes, by 2019. This decision came in as part of the government’s push to combat climate change by discouraging people from using private cars and using public transport instead. Coming at a time when fuel has become 16% costlier, this move has attracted considerable opposition from across the political spectrum. Andre, one of the protestors in Dole told AFP that “Macron is the president of the rich and not the poor. He needs to think about the poor as well.” Opponents of the move have argued that the government has disguised burdening the poor with more taxes under the farce of environmentalism. In January 2018, the government announced 8 centimes (the name used for a fraction of Euro in France) on diesel and 4 centimes on petrol, at a time when the prices were EUR 1.35 and EUR 1.5. There are plans to increase the taxes by another 6.4 centimes for diesel and 2.9 centimes for petrol. This is equivalent to paying an extra 10% on diesel and 5% on petrol as taxes. A large number of domestic consumers who were previously exempted or given reductions on their fuel taxes, will now be expected to pay it. The fuel tax may have been the trigger but the protests are not limited to that. “It’s about much more than fuel. They (the government) have left us with nothing,” Dominique, a 50-year-old unemployed technician told AFP. France is barely reeling out of the eurozone crisis of the late 2000s, with only recently registering a 2% growth rate. Public debt stands at 97% of the GDP and a tenth of the working age population are unemployed. To add to that, France real incomes have stagnated ever since the crisis, putting greater pressures on the lowest rungs of the population. Despite the hardships, France has remained better than most other large western economies, and this has to do with extensive social security and welfare programmes in place, coupled with labour laws that minimise much of the insecurities of workers in a post-crash society, compared to elsewhere in Europe where austerity and neoliberal measures were embraced wholesale by governments. But Macron continues to push for undermining the very same welfare state, jeopardising French workers and their families. The Yellow Vests do stand apart from the usual protests in France, in that there is no organisation or any leadership for the movement. The right-wing National Rally (RN) tried to make inroads into the movement but so far has not been able to hijack it. Leftist leaders like Philippe Martinez of France’s largest trade union, the General Confederation of Labour (CGT), and Jean-Luc Mélenchon, a long-time elected member of the National Assembly and the Left Front’s presidential candidate for the 2017 election, have extended their support to the protests and have posed their concerns to the government. But they or their movements have opted to stay out of actively participating in it. 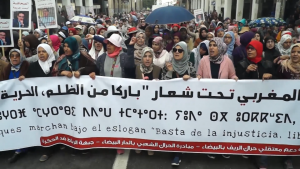 Perhaps it is the previous failures of trade unions to affect change against a government that enjoys a comfortable majority in the National Assembly or the spontaneity of mass outrage, but the protesters have deliberately opted to organise outside established political movements and unions. Political commentators in France have pointed out that while the movement is a legitimate expression of people’s anger, one must be wary of extremist elements taking over. Certain stray incidents of homophobic, xenophobic, and racist violence have been reported. In one incident, a Muslim woman’s hijab was torn by one of the protestors. But, so far, the movement has not allowed such incidents to distract attention away from daily concerns of livelihood and government-imposed impoverishment. On November 18, the otherwise peaceful protests started taking an ugly turn in some places, with the protestors clashing with police and some of the angry drivers affected by the protest. 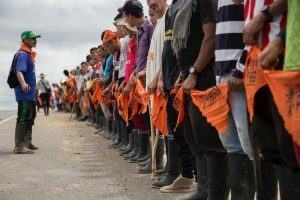 In one case, a 63-year-old woman who was participating in a blockade was run over and killed when a mother driving her daughter to the hospital panicked as protestors surrounded her car and hit the accelerator, rushing her car into the crowd. 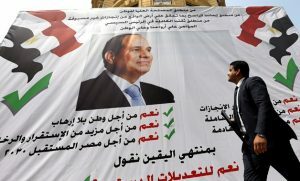 On November 20, the Interior Minister claimed that the protests are already fizzling out, but have resurfaced again. It remains to be seen if the government remains steadfast in their decision over the taxes. Hey Buddy!, I found this information for you: "Thousands protest hikes on fuel taxes across France". Here is the website link: https://peoplesdispatch.org/2018/11/25/thousands-protest-hikes-on-fuel-taxes-across-france/. Thank you.